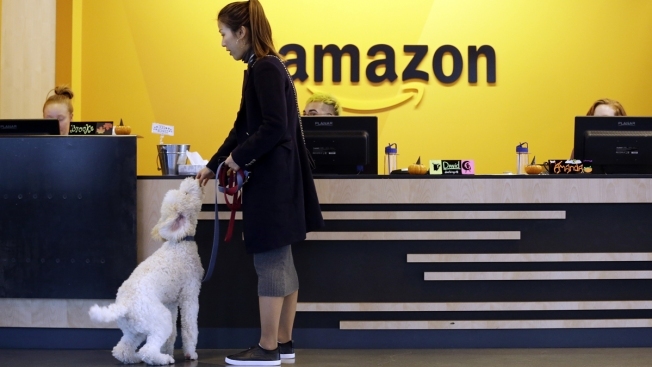 Amazon has been looking to find "a city that is excited to work with us and where our customers, employees, and the community can all benefit"
In this Oct. 11, 2017, file photo, an Amazon employee gives her dog a biscuit as the pair head into a company building, where dogs are welcome, in Seattle. Amazon announced Thursday, Jan. 18, 2018, that it has narrowed its hunt for a second headquarters to 20 locations, concentrated among cities in the U.S. East and Midwest. Amazon is done visiting the 20 cities that are finalists in its search for a second headquarters, sources close to the process told NBC News Wednesday. Amazon's "HQ2" will bring a $5 billion investment and as many as 50,000 high-paying jobs, the e-commerce giant has said. While Seattle-based Amazon hasn't revealed many details about the decision-making process, it has said it's been looking to find "a city that is excited to work with us and where our customers, employees, and the community can all benefit." Some cities in the top 20 have reported a surge in economic development inquiries from other companies since the list was released in January.